Our technical expertise is designed to complement the designer’s craft, freeing you to focus on what you do best. 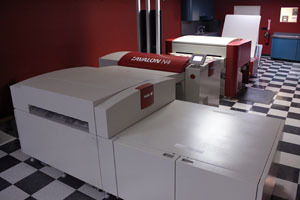 We offer an integrated electronic prepress service, including color separations, page assembly, image editing, color retouching and digital proofing. Our department is comprised of specialists in color scanning and calibration, digital image editing and electronic page assembly. Preflighting experts ensure trouble-free file processing through our PDF workflow. Dumont Printing’s prepress department has an average tenure of 30 years – each member with approximately 25 years of industry knowledge and prepress experience – to back you up and proactively care about your project as it enters the production flow.